The Yamaha name stands for quality and you can bet that their new Talon aluminum prop for mid range engines will be no exception. Yamaha Marine Group announced today it has launched a new series of high-performance aluminum propellers for its mid-range outboards that are standard-equipped with the exclusive Shift Dampener System (SDS™), bringing no-clunk, quiet operation to a broader range of boats. Named Talon, these new propellers were designed specifically for larger Yamaha mid-range outboards and have an all-new blade architecture that’s perfect for pontoon, walleye, deep V and fiberglass boats. A great companion to Yamaha’s new F115B outboard, the new Talon propellers bring a new level of quiet and comfort to Yamaha outboards from the F70 up to the F115, and the high thrust T50 and T60, as well. 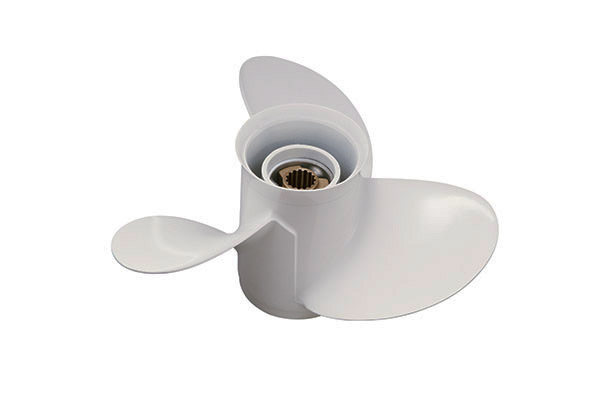 This propeller series features a new, replaceable SDS hub that requires no special hardware for proper operation. Talon propellers feature a high-efficiency, low slip design, have a 13.5-inch diameter, and are available in 9-inch, 10.5-inch, 12-inch, 14-inch, and 16-inch pitches. They not only greatly reduce the clunk that is sometimes associated with shifting, but also provide smooth and quiet in-gear operation, even at very low speeds. This is of particular benefit for outboards using in-line cylinder designs. The new Yamaha Talon propellers are expected to be available in early spring, 2014.